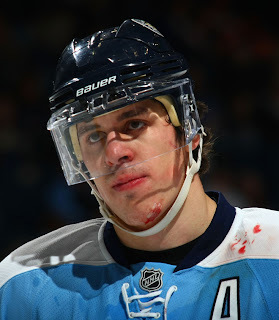 Seems the Pittsburgh media has made our beloved Geno a target of unprecedented scrutiny. Just in the past week we've witnessed two such articles from the Pittsburgh Tribune Review's Ron Cook and Rob Rossi scolding Malkin for his recent slump. Cook went so far as to say that Malkin is acting Jagr-esq and should (at the age of 23) have the mentally toughness to overcome such frustration. Rossi bursts on the scene today with an article that supposedly suggest Malkin's needs to play more worth his salt, that being the $8.7MM he receives annually. Instead Rossi proceeds to level ad hominen remarks against Geno's supposed unwillingness to handle the media as Crosby. And that he, "owes Crosby the NHL equivalent of covering his room-service tab." I'll be honest, I hardly ever care to entertain issues like these. In all honesty, the Crosby-Malkin debate is one that does more harm than good. The media (yes, even bloggers) can have an impact on the relationships between players and that's generally one I like to stay out of. Far be it from me to add any tension between the two best things to happen to Pittsburgh since the Lemieux-Jagr era. However, the gentleman above both have a voice in Pittsburgh sports far greater than I'll ever likely have. With that, I feel since the local media is bashing the very guy who won the Art Ross and Conn Smythe last year, I should probably at the very least say a word or two. The Pensblog boys did an excellent job at refuting the claims of Cook and Rossi earlier this evening. Them being from Pittsburgh can surely relate the the buzz better than I, living in Raleigh, NC. And with their influence in the area they sure have an impact on the hearts and minds of the local residents. Their article surely needs to be read. Let's send the Penguins to the KHL. Let's see how Crosby deals with the Russian media. This of course is not to take anything away from Sid, he's as important to my fanhood as any player I've ever watched. He's no doubt my favorite player. Shoot even my 4th child's middle name is Sydney [female version]. But outside of my opinion Sid is arguably the greatest hockey player on the planet right now. But Geno deserves more respect than this. Geno deserves to be encouraged more so by the media, particularly his own. His accolades last year should have gained him enough respect, though apparently it has not. Sid has had slumps. As long as Geno's? Maybe not, but slumps nevertheless. Should it be pointed out that Geno is currently not playing up to par? Of course. Is it right to mention he's having his worst season in his young career? Yes, it would be a lie NOT to suggest it. But there is a big difference to state the fact that Malkin is not having the year he did last, and then to compare him to Jagr as if he was as "moody and sulky" as he. Or as Rossi sarcastically notes, "he is to the best player debate what Conan O'Brien is to "The Tonight Show." Gentleman, the fact that you're open to your opinion is what makes this country great...freedom of speech. However sometimes in best to keep your jaded subjective opinions to yourselves. The conclusions you're drawing and statements you're making is practically yellow journalism. I long for the day in the not-so-far-off future when Malkin gives you both a reason to stop bashing him and start kissing...his feet.